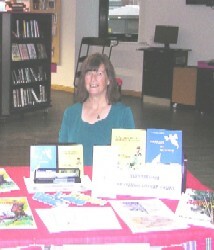 I had a great day at the Wellington Literary Festival yesterday despite a disappointingly low number of visitors. I met some interesting poeple and made some useful contacts for the future and all those authors present managed to sell one or two books, myself included. The venue at Wellington Library is wonderful, such a vibrant atmosphere and children’s author Catherine Cooper is to be congratulated on all the hard work she puts in to organising this event each year. You can learn more about Catherine Cooper and her books here. With no new books to offer this year this is the only Book Fair/Festival that Silverburn Publishing has attended in 2014 although it is hoped that another small event may yet be fitted in before Christmas! Look out for something new next year. 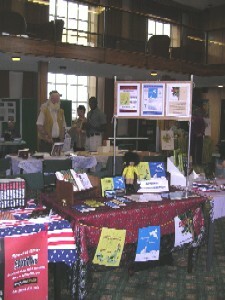 In the quite before the rush this picture of our stall was taken at the annual Nottingham Book Festival and Fayre. The day was a wonderful opportunity for meeting other writers and attending talks and workshops, with an appreciative public spoiled for choice among the many stalls. This was the first time we have attended and it was an enjoyable day which we hope to repeat in the future. Elizabeth Leaper will be there on Saturday 8th October to sign and sell copies of both ‘Barking At Nothing’ and ‘Colelcting Cobwebs, Gathering Brambles’. It will also be possible to purchase copies of ‘Mission Scapula’ by Arthur Christie.